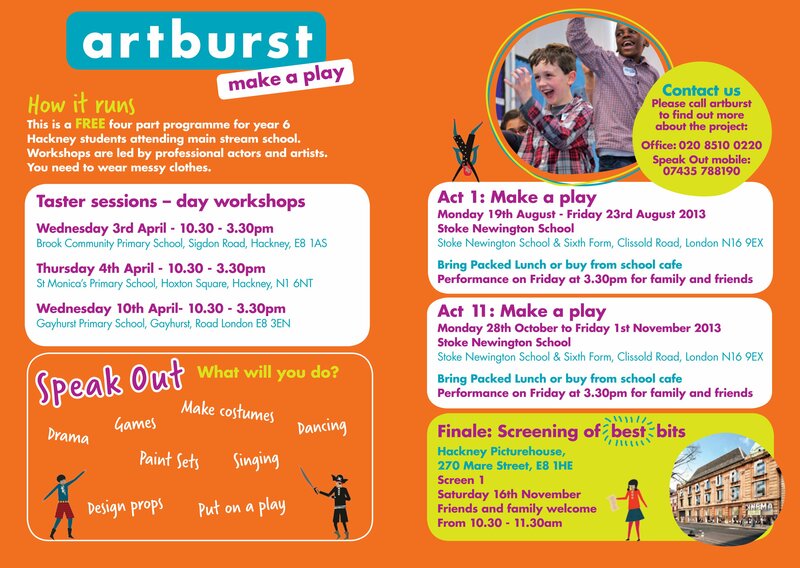 Speak Out Make a Play is a programme of one day taster workshops in the Easter half term followed by 1 week-long integrative arts workshops for Year 6 students in the Summer and then the Autumn school holidays During these workshops students will devise, design and create a play in 5 days with support from a team of Artburst facilitators and a trainee Speech and Language Therapist. At the end of the week students perform a play to family and friends. Plays are based on well-known children’s story books such as James and the Giant Peach by Roald Dahl. The plays are filmed and then screened at the popular Hackney Picturehouse. The project is to support the transition to secondary school for children with speech, language and communication needs (SLCN).